St. Dunstans Archery Club - Whatt is VI archery? 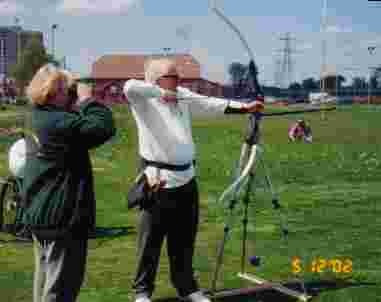 What is Visually Impaired (V.I) Archery? A question asked many times, is what is V. I. archery? 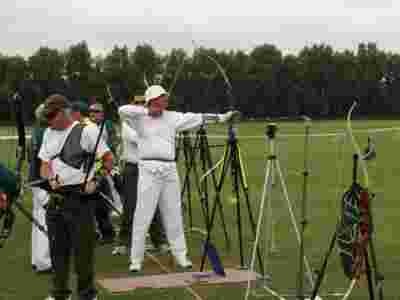 Or how does a blind person use a bow and arrow? Let me see if I can enlighten you. Firstly there are two separate classifications in V.I. archery. 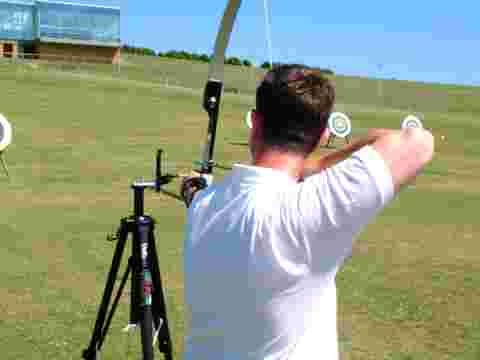 A person may be registered blind, but due to different sight impairments, may still be able to see an archery target.These archers shoot using a bowsight, the same as a fully sighted archer. 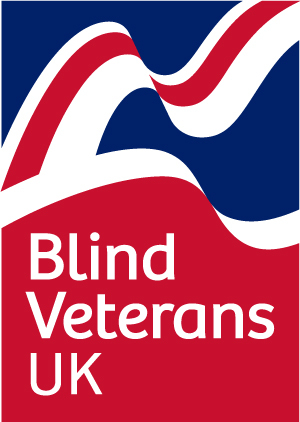 However if due to a persons sight impairment, they can not see the target, they use what is called a tactile sighting aid. To explain this. Imagine lining up on a target, using a bow and arrow, then closing your eyes. What datum do you have? None! A V.I. archer has a tactile sight fixed to the top of a tripod. The archer touches the back of their bow hand.to this tactile sight. Similarly the archer can mark the position of their feet, by a stick, feet shaped blocks, or more commonly used are foot-locators. A sighted person, usually called a spotter, notes the strike of the V.I. archers arrows. Using the clock face numerals and the corresponding colours on the archery target. For example, 12 o'clock red. After the archer has shot his end of arrows, they may retire from the shooting line. 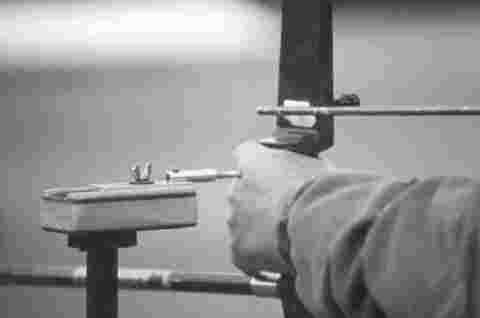 Then using the foot markers and the "back of the hand device" locate themselves in the same position for the next set of arrows. YOU may now realise, by this description, that the archer relies not on the spotter to guide their arrows; but use their posture concentration, and repetition to repeat a good shot. When the spotter reports the strike of the arrow, it is up to the archer to adjust their posture to hopefully hit the "gold".